Visit SyntecOptics.com when you are looking for heads up display plastic prisms. We offer effective options that are ideal for defense applications. 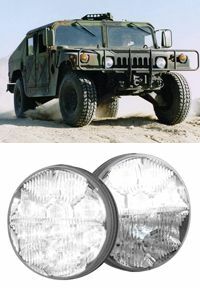 From heads up display plastic prisms to flashlights to headlamps, we can assist with your military optics project needs. Syntec Optics, your source for custom molded optics, was commissioned to custom-manufacture a Lexan LED headlamp used in an illumination application for the defense industry. We have manufactured complex optical inserts for the mold using our state-of-the-art Single Point Diamond Turning (SPDT) process. We perform a series of tests and inspections on our heads up display plastic prisms and other diamond turning optics, including extensive testing on the coating. The optical luster is considerably improved through Syntec’s innovation as compared to previous versions attempted by competitors. The finished Syntec product has proved to be of superior quality and design with better optical performance at a lower cost to the customer. For more information on Military LED Lighting and Military Optics or to learn more about our other molded optics, please contact Syntec Optics. We are happy to answer any questions you may have about our heads up display plastic prisms and diamond turning optics.